Mother and daughter weave stories inspired by pioneer heritage. I always enjoy stepping back in time with a nice day trip to one of Arizona’s charming historic mining towns with miners shacks perched precariously on hill sides. 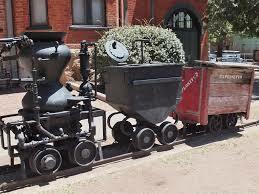 Leafing through an old photo album, I peruse pics of a lovely visit to Bisbee. 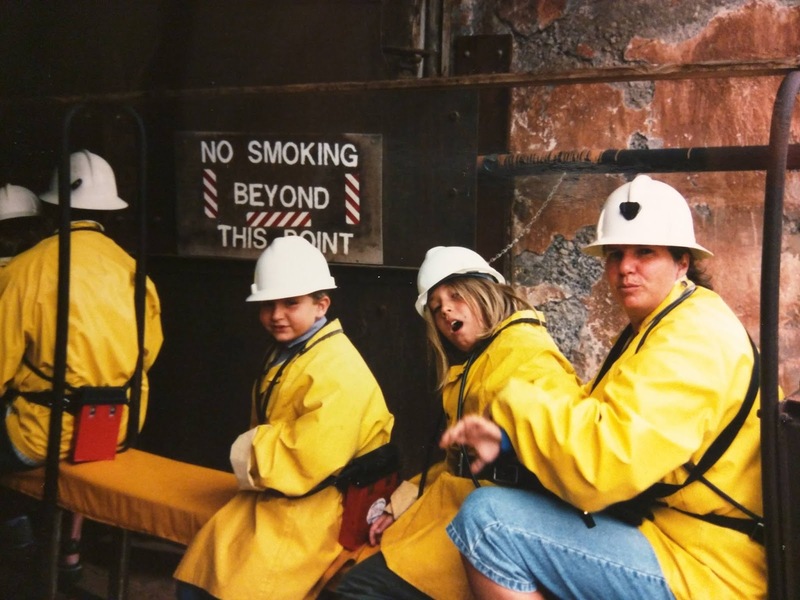 In one, my family wears yellow jackets and hard hats with mining lights. I recall how we straddled a wooden 2X8 seat on the mining train, and were pulled into the narrow rock tunnel to hear stories of courageous men overcoming devastating hardships. The guide (a retired miner) shared awe-inspiring tales of human resourcefulness and ingenuity in conquering nature. I flip to another page. After antiquing in Globe, we traveled past less scenic mining towns with ugly boarded up storefronts and dilapidated houses. I was shocked by the miles and miles of abandoned strip mines. More like - land stripped. Land stripped of trees, or any living thing. Land that will never be able to grow anything again. 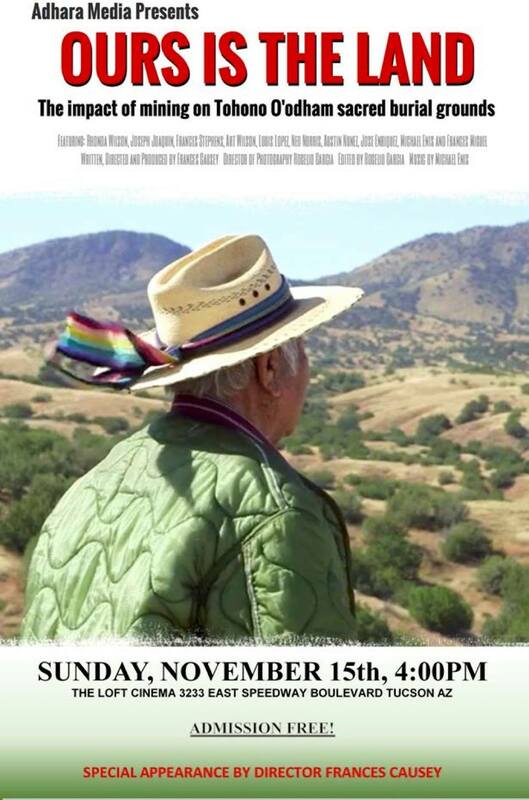 Watching Francis Causey’s doc, “Ours is the Land,” made me aware of the plight of the nearby Tohono O’odham with the Rosemont Mining Company. The Canadian mining company (with an abhorrent environmental impact record) is attempting to purchase Tohono O’odham holy land for $5 an acre. (You read that right - $5 an acre. The price is set by antiquated law from 1872). In addition to the damage it will do to the desert habitat (where the Tohono O’odham harvest their daily food), it will contaminate their ground water. And the mine doesn’t just affect the reservation. THE MINE WILL USE UP 20% OF TUCSON’S REMAINING GROUND WATER. How can we consider that, when we already supplement our ground water with Colorado River water? Meanwhile, in another part of our state, Lake Powell has been contaminated with toxic yellow tailings runoff from an abandoned mine in Colorado. No effort was made on the part of the mining company to dispose of the tailings before they leaked into COLORADO’s Animas River. Mining is threatening Arizona’s precious water supply! For the past decade Arizona has been experiencing a drought. Climate change is already reducing precipitation needed to replenish the rivers that supply our water. It is predicted that groundwater will decrease by 20-40 percent by mid-century. Meanwhile, in another part of the state, the San Carlos Apache and many of Superior’s townspeople are fighting to keep the Oak Flat Mountain from becoming a gigantic crater. 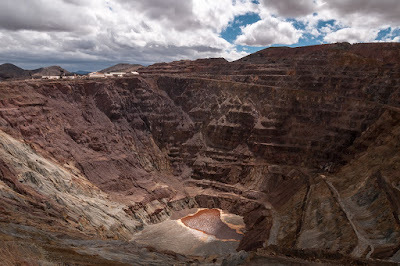 Arizona Senators McCain and Flake snuck in a last minute rider on a must-pass annual defense department funding bill that allowed the Australian-English mining companies, Rio Tinto and BHP Billiton, to block-cave the pristine mountain. Oak Flat, which is sacred to the San Carlos Apache, is also protected by law as a national forest. Even the residents of nearby Superior – many miners themselves - don’t want the mine. Besides destroying a favorite recreational area, it will use up the town’s ground water. So why would Senators McCain and Flake destroy our national park and deplete our precious ground water supply for foreign mine interests? They claim it is to create jobs and improve our economy. But this is a temporary fix at best. Ask the 450 miners at Green Valley-based Sierrita and the 211 miners at Tucson-based Asarco - who were laid off due to declining profits. The jobs are temporary, but the damage to our planet is long-lasting. Looking back at Arizona history, it’s not hard to see the precedence for this policy. Mining has always been a big part of Arizona’s economy. Arizona was founded on mining interests. (Before that there were only Native Americans and ranchers). But if you look beyond the historic façade, you see a bitter truth – desperate men slaving away and dying in the mines for the profit of a few. 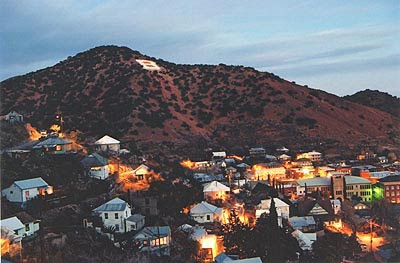 Scenic Bisbee is shrouded in suffering. 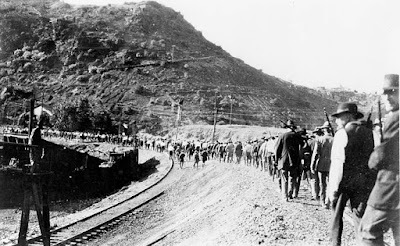 In 1917, 1,286 miners and their supporters who were striking for safer working conditions and fair pay, were arrested by authorities and loaded into cattle cars with three inches of manure on the floor. Although temperatures were in the 90s, no water was supplied. The train stopped 10 miles east of Douglas to take on water. The train was guarded by two deputies with machine guns and 200 armed men. The strikers were finally dropped off 200 miles away. As much as I like to step back in time to Arizona’s “good ol’ days” by visiting our quaint mining towns, perhaps it’s time to improve on history before Tucson and Phoenix become barren ghost towns too. This is an Article everyone should read and think about. Politicians are never looking to help the common person unless it benefits them more!!!! We would love to hear your thoughts and comments!